"I think there's a lot of interest in trying to discern what direction is U.S. foreign policy going to take under the Trump administration," Associate Professor Thomas Smith, Director of the Honors Program at USF St. Petersburg, said. "There seems to be extraordinary interest this year, people are really hungry for this kind of thoughtful information about the new directions the country will take." The free event starts Wednesday morning at 8:30 at the USF St. Pete University Student Center. St. Petersburg Downtown Partnership President Peter Betzer (far right) talks about the city's connections to the world as Mayor Rick Kriseman (center) listens at last year's conference. More than sixty speakers, including diplomats, military, media and academic experts will take part in thirty different panels. According to Smith, the range of topics covered shows that international relations are about more than just diplomacy or war. "We have panels this year on cyber meddling, on international education, we have a panel on NAFTA and other trade agreements, we've got panels on Brexit, music and art," Smith said. He adds that the huge variety of speakers means there should be a plethora of opinions for attendees to digest. "We've deliberately tried to put together panels that represent a range of perspectives, because we really want to see this as a contest of ideas in which we can focus on a number of perspectives and not just a single one," Smith said. While the conference is free, seating is available on a first come, first serve basis. Attendees are encouraged to sign up here for more information. 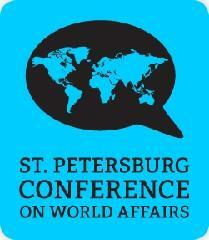 WUSF's University Beat report previewing the 2015 St. Petersburg Conference on World Affairs Feb. 26-28. Some of the major international issues of the day - Cuba, Russia, Syria, terrorism and immigration - will be among the topics of discussion at a Saint Petersburg conference that's drawing experts from around the world to the Tampa Bay area. 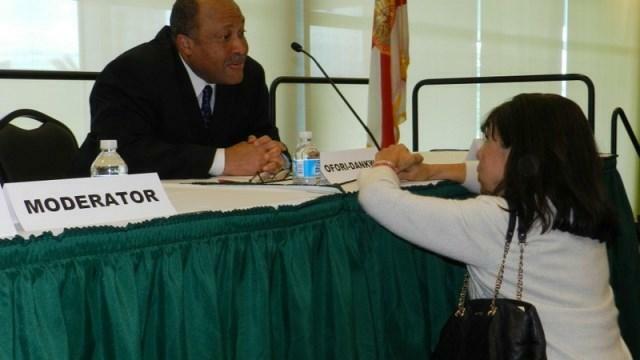 The Saint Petersburg Conference on World Affairs takes place Thursday, February 26, through Saturday, February 28 at the University of South Florida St. Petersburg University Student Center. Almost forty panelists, including 1986 Nobel Prize winner for Literature and expert on Nigerian democracy Wole Soyinka, along with diplomats, academics and military experts will share ideas and information during 16 free panel sessions. One of the most powerful questions that can be asked is "What if?" What if America lowers its troop presence overseas? What if there's another Arab Spring? What if a new country or even terrorists get their hands on a weapon of mass destruction? As Dr. Mohsen Milani explains, those kind of scenarios are the focus of a conference, The Greater Middle East and Central Asia in 2020 and Its Implications for American Foreign Policy, taking place at the University of South Florida next Monday and Tuesday. For the second year in a row, St. Petersburg is hosting foreign affair specialists to talk about some of the most important international issues of the day, ranging from the United States' role in the Middle East, cyber-terrorism, and climate change. 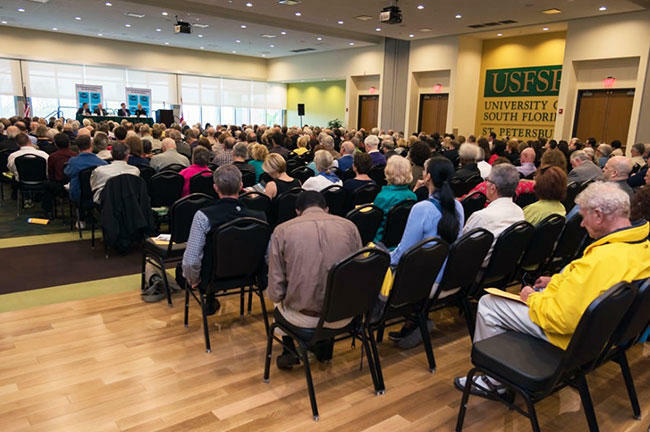 The St. Petersburg Conference on World Affairs, which began Thursday, is taking place at the USFSP University Student Center today from 9 a.m. to 4 p.m. and tomorrow from 9 a.m. to noon.